This may be the most elegant thing I have ever attempted to bake, and probably pronounce. It all began over Christmas holiday 2015 when I completely fell head over heels in love with “The Great British Bake Off.” A show that rivals any baking competition I have ever watched. It all takes place in a magical tent on the countryside where contestants are given three baking challenges to complete. A Signature, a Technical, and finally a Showstopper(and boy is it a showstopper) they are judged on all three before they can move on to the next week. They have a reasonable amount of time in order to complete each task, unlike the usual ‘bake 300 cupcakes in a hour while being yelled at’ show I normally indulge in. The contestants are a wide variety of ages, backgrounds, and skill levels. It’s also British so naturally the contestants treat each other with respect and courtesy, and they all have a lovely accent to boot. In the end I acquired a girl crush on Martha, and a desire to make and eat Feuilleté de Poires which essentially means pears in puff pastry. This bake was given as a technical challenge, and I totally understand why. Puff pastry is always going to be a pain in the tuckus, even when you're not on a reality T.V. show. It involves a lot of time and patience to be able to correctly work the dough in such an intricate folding process. I can only imagine doing this bake with cameras watching (oofta! thank goodness that wasn't the case). Everything else however was a breeze. 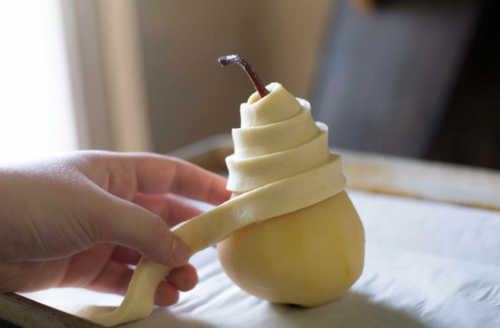 Poaching a pear is pretty much glorified boiling, and if you save yourself some of the wine to sip on while you wrap the pears in puff pastry. It makes you forget any stress that might have been acquired when making the pastry in the first place. So you can just relax and enjoy the smells wafting from the oven. Make the pastry: In a medium size bowl mix together the flour and salt, adding a tablespoon at a time of the ice water. With a fork or fingers loosely mix together. Continue adding water until the dough holds together when pressed. Wrap the dough in plastic and place in fridge to rest. Refrigerate for at least 30 minutes. Prepare butter block: I usually cut the butter in half sprinkle with a bit of flour and then start hitting it with a rolling pin. Keep hitting and adding flour until the butter is pliable enough that it does not break when folded over on itself. Shape it into a 4x4 inch square, wrap in plastic and chill for 10 minutes. Wrap the Butter: Remove dough from fridge and roll out into a 7x7 inch square. Place the square of butter on top of the dough at a 90 degrees to the dough. Fold the corners of the dough over the butter so that all four corners meet in the middle. Pinch to seal. Roll out Dough: Flip the packet over so no seams are showing, and roll into a rectangle around 12 inches long 6 inches wide. First Turn: With the rectangle horizontal take the right edge and fold a ⅓ of the dough towards the center. Take the left edge and fold a ⅓ of it over the first fold. Making a vertical neat packet. Turn horizontally. Second Turn: Roll into a 12 x 6 rectangle. Fold right edge to the center, fold left edge over the right. Turn horizontally. (make 2 notches on edge of dough with a knife) Chill for 30 minutes in fridge. Third and Fourth Turn: Repeat step 1 and 2. Mark 4 notches. Chill in fridge for 30 Minutes. Fifth and Sixth Turn: Repeat Step 1 and 2. Dough should feel smooth and easy to work with. Chill for one hour or overnight. Use right away or keep in freezer, make sure to thaw 30 minutes before use. Poach the pears: Combine sugar, wine, cinnamon sticks, zest, vanilla bean, and cloves in a medium saucepan and bring mixture to a simmer. Peel the pears and add them to the pot cover and let simmer for around 25-35 minutes, turning occasionally, until tender. Remove from poaching liquid and let cool. Reducing the Liquid for a Sauce: Strain poaching liquid and return to pot to cook over medium high heat until liquid is reduced by half (about 20 to 30 minutes). This liquid can then be served alongside poached pears. 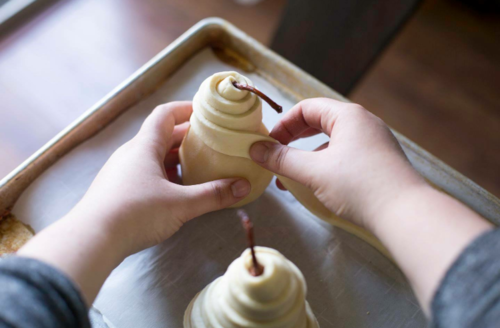 Baking: Wrap the cooled poached pears in strips of puff pastry. 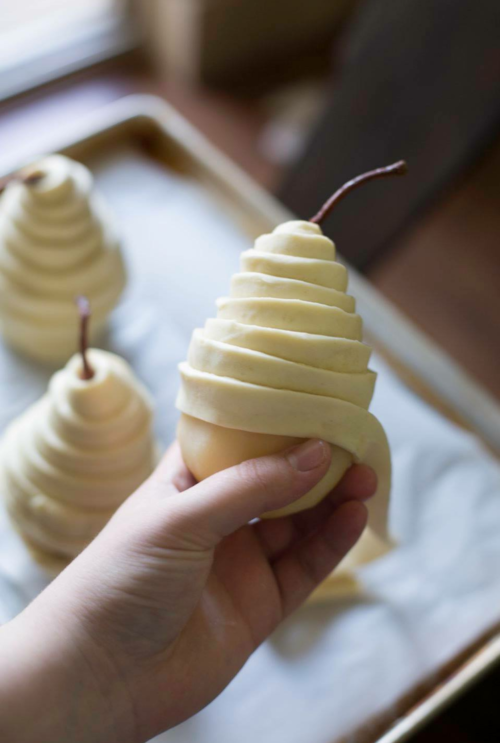 Place the pastry covered pears on a baking tray, and brush with a mixture of beaten egg and tablespoon of cream. Bake for 25-30 minutes at 400°F Rotating half way through. When golden brown remove from the oven and let cool for 10-15 minutes then serve with a drizzle of the reduced sugar syrup.